"This book aims to understand the politics of slums, particularly how struggles for secure housing and improved living conditions in substandard Southern settlements reveal the power struggles and tensions of urbanization processes. 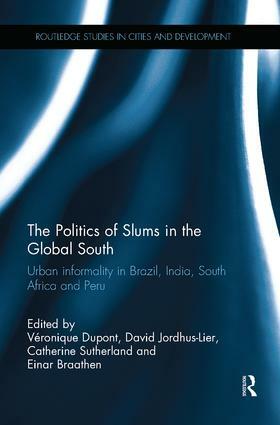 Focusing on six cities – Rio de Janeiro, Delhi, Chennai, Durban, Cape Town and Lima – and 11 case studies of informal settlements, many of which are impacted by large-scale infrastructure projects, the authors discuss processes of settlement formation, demolition, upgrading and resettlement. These analyses are embedded within globalized debates on the neoliberal city. Urban development is conceptually positioned along a diverse set of debates around topics including social (non-) movements, civil society, coping strategies, collective action, spaces of citizenship, the quiet encroachment of the ordinary, and insurgent urbanism." Véronique Dupont is Senior Research Fellow at the French Institute of Research for Development (IRD) in the Centre for Social Sciences Studies on Africa, America and Asia (CESSMA), Paris, France. David Jordhus-Lier is Associate Professor in the Department for Sociology and Human Geography, University of Oslo, Norway. Catherine Sutherland is Lecturer in the School of Built Environment and Development Studies, University of KwaZulu-Natal, Durban, South Africa. Einar Braathen is Senior Researcher in the Department for International Studies at the Norwegian Institute for Urban and Regional Research (NIBR), Oslo, Norway. The series features innovative and original research on cities in the Global South, aiming to explore urban settings through the lens of international development. The series particularly promotes comparative and interdisciplinary research targeted at a global readership. In terms of theory and method, rather than basing itself on any one orthodoxy, the series draws on a broad toolkit taken from across social sciences and built environment studies, emphasizing comparison, the analysis of the structure and processes, and the application of qualitative and quantitative methods.